Discussion in 'Sports Games' started by T_Riddler_, May 26, 2018. 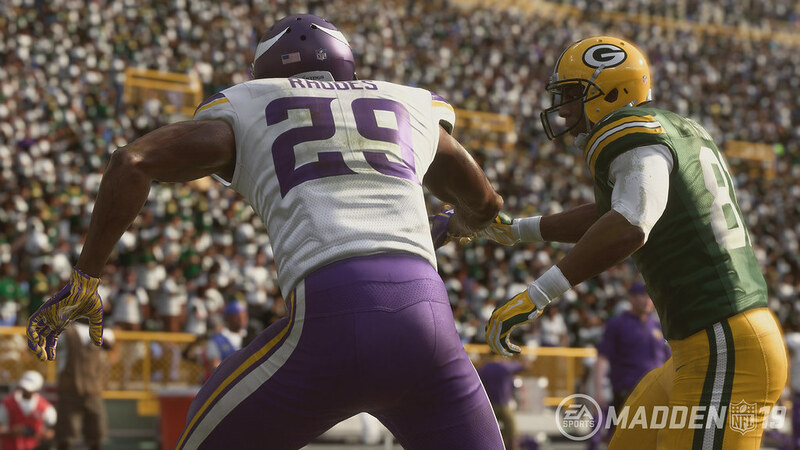 Building on the success of last season, Madden NFL 19 pushes gameplay farther than ever before, with advances in popular game modes and control put solidly in the players’ hands. At the forefront of these changes are the enhancements to player influence. 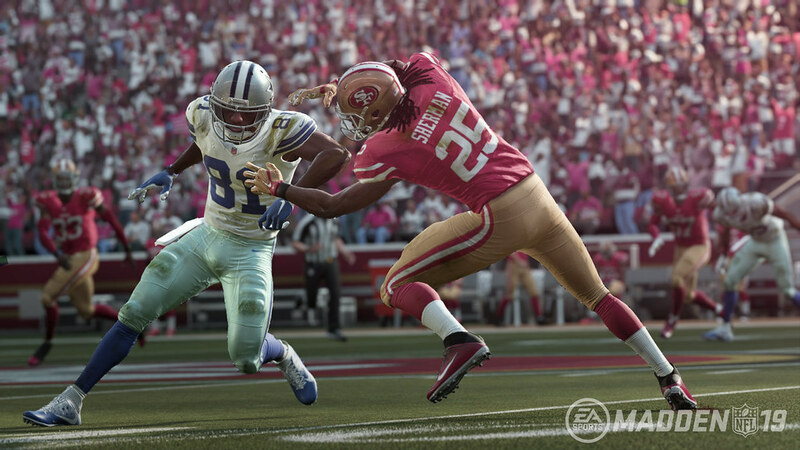 Madden NFL 19 will deliver unprecedented control with Real Player Motion. RPM brings realistic character movements and animation variety, creating authentic movement unique to positions and body types that delivers game-changing control and precision on the field. For example, RPM allows you to “Hit the Hole” by finding an open lane, maneuvering around your opponent, and seamlessly running through the lane for that critical extra yardage. For the ultimate fantasy football team, there’s Madden Ultimate Team, and now there are even more ways to play with your custom roster. 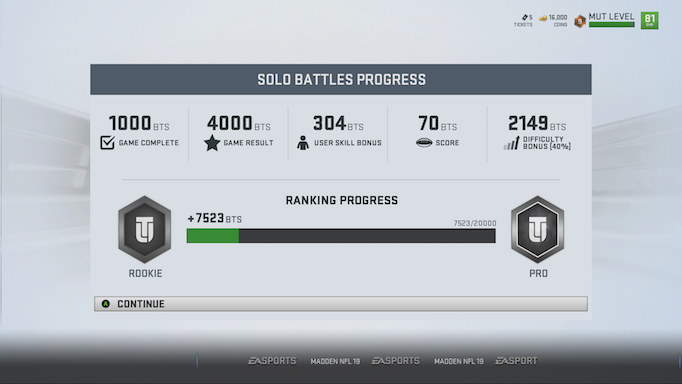 Solo Battles is a leaderboard driven reward system comparing your performance in daily single player challenges against other top MUT players. MUT Squads was a popular game mode introduced last season that allowed players to combine efforts to build amazing rosters for online 3 vs. 3 matchups. In Madden NFL 19, you can team up with friends against the CPU to take on tough challenges set to push your teamwork to the limit. A longtime favorite mode in the Madden community is Connected Franchise. This mode gives players the ultimate NFL experience. 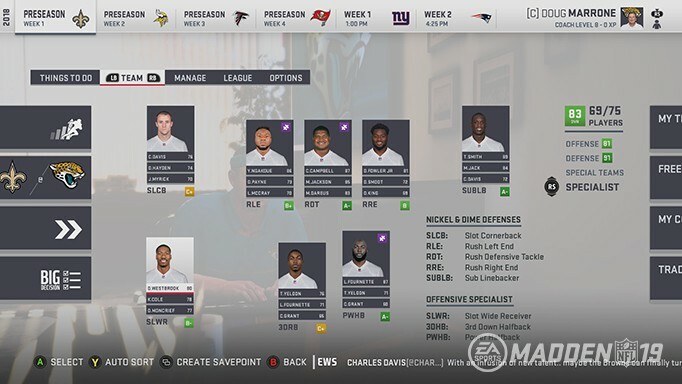 With Madden NFL 19, in addition to controlling the NFL team of your choosing, you’ll be able to adjust the roster to completely fit your scheme and gameplan thanks to Player Positional Archetypes, which help determine which players are the best fit. Improve how well your roster and scheme match as you earn XP and spend Skill Points to boost specific skill sets. Madden NFL 19 is set up to be the best Madden season yet and is coming to PS4 on 10th August. Experience Franchise in a whole new way! Step into your coach’s office and build your team into a dynasty. Upgrade your players, balance your scheme, and make decisions about your depth chart to impact your success on the field. After the game, visit your players in the locker room and slap a Captains patch on the superstars. Back in your office, soak up the best snapshots from the game on your TV and in the news. Download a community-created draft class and head to the NFL Draft. Find the hidden gem that fits your scheme and see your next superstar revealed on the stage. 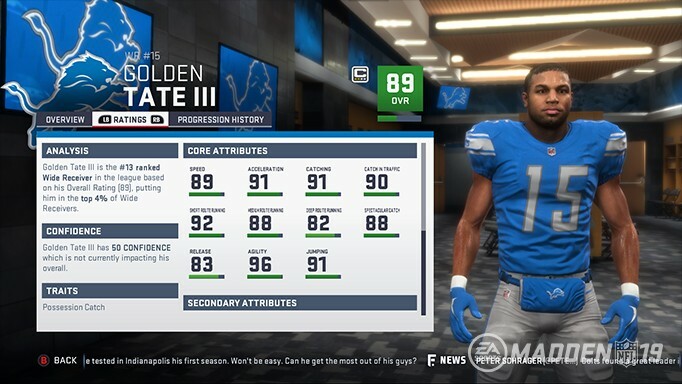 Madden NFL 19 introduces a new way to progress and classify your players in Franchise with the Archetype Progression system. Each position is now broken up into two-to-four styles used to grade the player. For example, the quarterback position now has four styles: Field General, Scrambler, Strong Arm, and West Coast. Matt Ryan may be an 88 OVR West Coast, but only a 78 OVR Scrambler. On the other hand, Deshaun Watson may be an 82 OVR Scrambler but only a 79 OVR West Coast. These archetype OVRs make it easy to evaluate a player’s strengths and weaknesses. Earn Skill Points by acquiring enough XP for a player to level up. XP is earned during gameplay, training, awards, and more. Once you’ve earned a Skill Point, spend it on one of the Player Archetypes to upgrade the OVR for that Archetype by a full point. At the end of each game, you are presented with all the players that have skill points and are ready to upgrade. 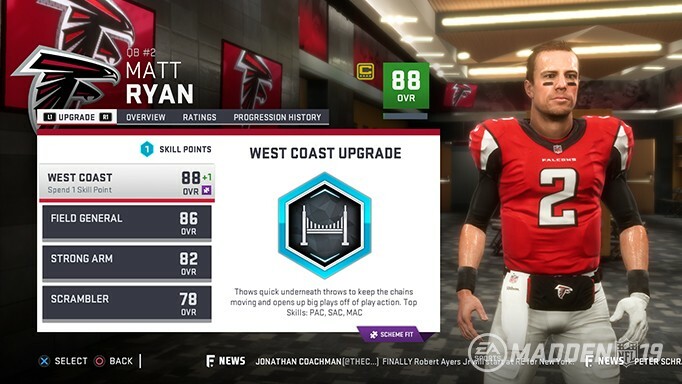 Let’s say you want to upgrade Matt Ryan’s West Coast OVR. It’s currently an 88 OVR, so spending one Skill Point will increase his individual player ratings, which will elevate his West Coast to an 89. This time, the West Coast upgrade awarded +1 to Play Action and Deep Accuracy and +2 to Short Accuracy. If he got a second skill point, he could receive +1 to Play Action, Short Accuracy, and Throw Power. The number of rating points earned from each upgrade varies, but they will always move you up one OVR point in the selected archetype. The decisions you make with this progression system are powerful. 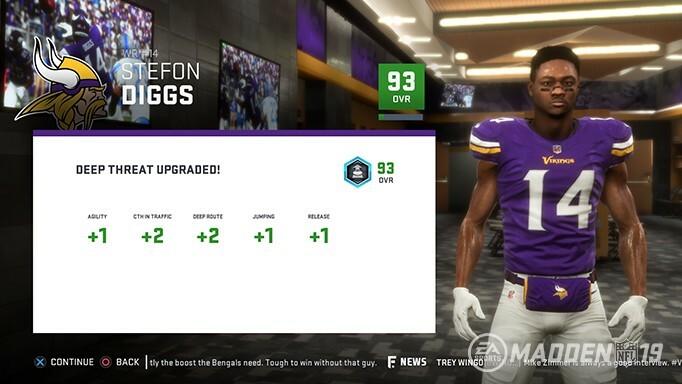 Instead of just going up one rating at a time, your players progress a full OVR each upgrade. It’s a dynamic system that ensures players progress in unique ways, while still giving you control over the players’ total progression paths. Your coach’s scheme matters more this year, thanks to the Scheme Fits feature. Build your team with players that match your scheme and they will develop faster, giving you more success on the field. Start by choosing an offensive and defensive scheme. To make your decision easier, scroll through the available schemes to see how many players on your roster are a Scheme Fit. Each scheme looks for a specific Player Archetype for each position. 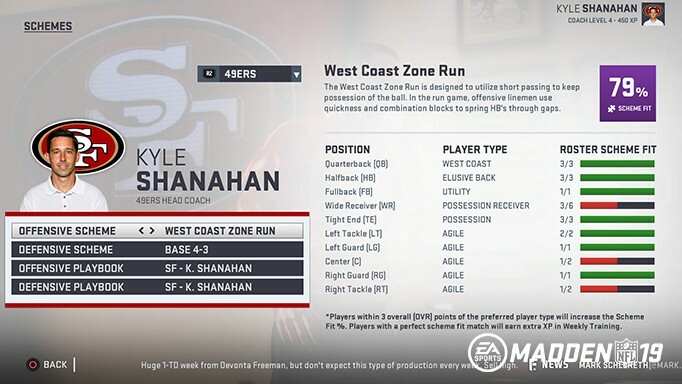 For example, the West Coast Zone Run scheme looks for Agile offensive linemen. All offensive linemen that are Agile will have a puzzle piece Scheme Fit icon denoting they’re a match. This helps you find the players that best fit your team. The scheme fit icon is visible in Free Agent Bidding, Trading, Scouting, Drafting, and more. Change your scheme at any point for full control over how you build your team. Draft a stud Strong Arm QB in the first round and want to maximize his development? Simply switch to a Vertical Power Run or Vertical Zone Run offense and start building your team around him. Your QB will now get bonus XP in training because he is a scheme fit. Shape players to fit your scheme by upgrading the archetype your scheme prefers until they flip to a new player type. Players that have balanced Archetype OVRs are much easier to flip than ones that are far away. The #1 requested feature by the community is here. 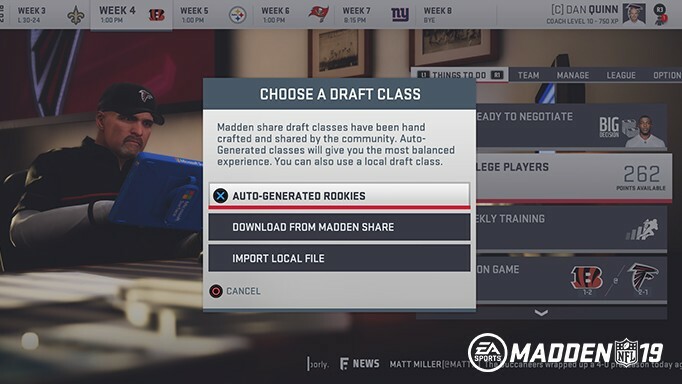 Get ready to create and share Draft Classes using Madden Share. When Scouting starts in Week 3 of the regular season, you will be prompted to either use an auto-generated class, download a class, or import a locally-saved class. Download and import any time Scouting is available, even if it’s later in the season. Creating and sharing a draft class is easy. Start with an auto-generated class and edit as much or as little as you want. While on the main Scouting menu, press the “Edit Players” button to kick off the process. Choose to edit the current class or import/download another one. If you edit the current class, then you will be taken to a spreadsheet that reveals everything about the 450 players in the current draft class. Easily move players up and down the draft projection using the “swap” and “insert above” tools. Select each player and edit his Player Info, Appearance, Equipment, Ratings, and Player Traits. 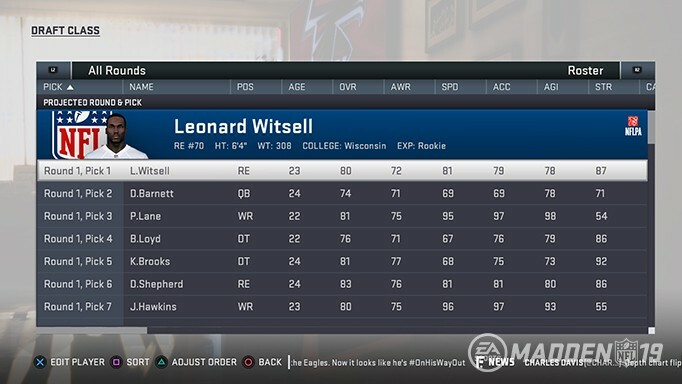 When you access the Draft Class Creator menu, a Transaction Log item is sent so other people in your league know that you saw the full draft class. The Transaction Log is also notified each time a player is edited so that others can keep track of who you are changing. For multi-user leagues, only the Commissioner can adjust the draft class. 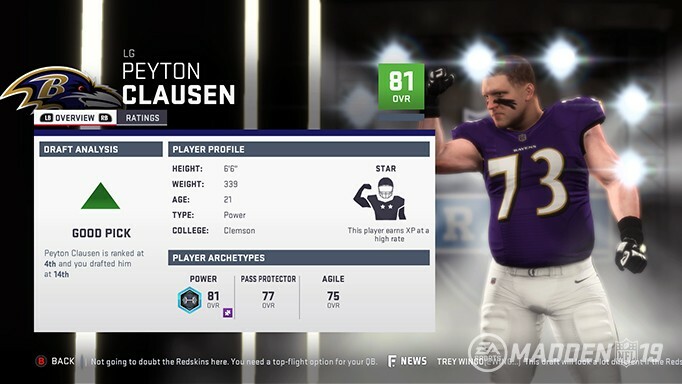 Find all the draft classes the community has created in Madden Share. Sort by most downloaded and top liked to find the class you are looking for. Download a draft class, make edits, and then upload a new one. Everything is at your fingertips when you’re using the Draft Class Creator. Your team now has a Specialist section with seven depth chart positions. These positions ensure the right players are on the field in the right situations. Nickel and Dime defenses now use Rush Left End (RLE), Rush Defensive Tackle (RDT), Rush Right End (RRE), Sub Linebacker (SUBLB), and Slot Cornerback (SLCB) positions. These players are best for downs when the offense is likely to be throwing the ball. For RDT, RLE, and RRE, this means that the run stoppers are leaving the field and the pass rushers are stepping in. The CPU won’t put in a player that has low pass rush moves in this position. For Sub Linebacker, the best pass coverage linebacker will fill this spot. Your Slot Corner will be the best players on your team using the Slot Corner OVR, but will not fill with CB1, CB2, FS1, or SS1 unless their archetype is Slot Corner. The Slot Wide Receiver (SLWR) depth chart position will be the best players on your team using the Slot Receiver OVR. It will not be WR1, WR2, TE1, or HB1 unless their archetype is Slot Receiver. 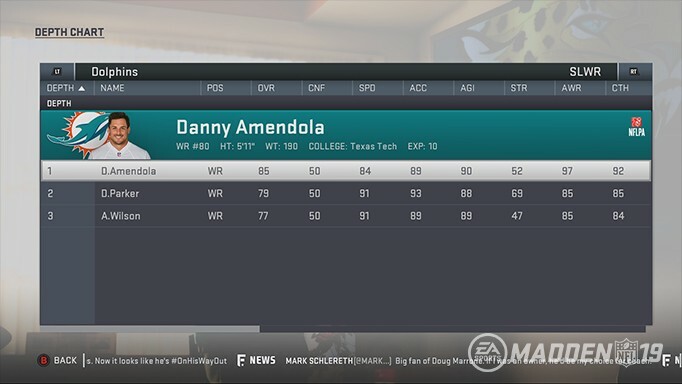 This will ensure that players like Miami Dolphins' Danny Amendola are used in the slot, but guys that are better outside will stay outside. Power Halfback (PWHB) is used in goal line formations and other heavy sets as your running back. He will be the best player on your team to tote the rock between the tackles using the new Power Back OVR. If you have an elusive back as your best halfback and want to keep him in on goal line formations, just swap him into the PWHB starting position. You have the control! 3rd Down Running Back (3DRB) now uses the new Receiving Back OVR. Your 3DRB will come in on 3rd Down for many formations. Some playbooks even have your 3DRB come in on shotgun formations for other downs, too. Kick Returners (KR) and Punt Returners (PR) got some love as well. The CPU will never have a starting HB, WR, CB, or S as a Kick Returner. The CPU will use starters to return punts if their Kick Return rating is high enough, though. This means that guys like Antonio Brown will be back there during punts, but won’t see the field during kickoffs. Eleven fresh ratings have been added to help differentiate players and bring to life the Archetype system. 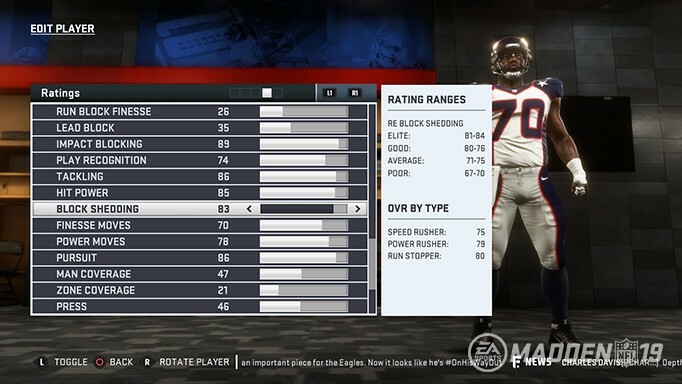 For example, the new Run Block Finesse and Pass Block Finesse ratings will be featured on Agile linemen. Meanwhile, Power linemen will rely on the new Run Block Power and Pass Block Power ratings. Break Tackle: Determines broken tackle success for ball carriers vs standard tackles (not Hit Sticks or Cut Sticks). Break Sack: Determines whether the QB will escape a sack inside the pocket. Throw Under Pressure: Determines passing accuracy when throwing under pressure. Run Block Power: Determines success chance for Drive, Down, and Power Double Team blocks on plays like Toss and Power O. Run Block Finesse: Determines success chance for Zone, Reach, and Zone-Double Team blocks on plays like Outside Zone and Stretch. Lead Block: Determines success chance for blockers leading from the backfield or pulling from the line. Pass Block Power: Used versus defensive power moves. Pass Block Finesse: Used versus defensive finesse moves. Short Route Running: Used when running short routes (Slant, Drag, etc.). Medium Route Running: used when running medium routes (Curl, Dig, etc.). Deep Route Running: Used when running deep routes (Corner, Streak, etc.). We’re unleashing the power of Frostbite in Franchise with the addition of immersive environments. While playing as a coach or owner, you’ll be exploring your coach’s office. If your coach has won a Super Bowl, you’ll see a Lombardi trophy on the shelf. Head to a locker room environment to interact with your players. If you’re playing as a player, you will see your player in a locker room as he prepares for his next game. 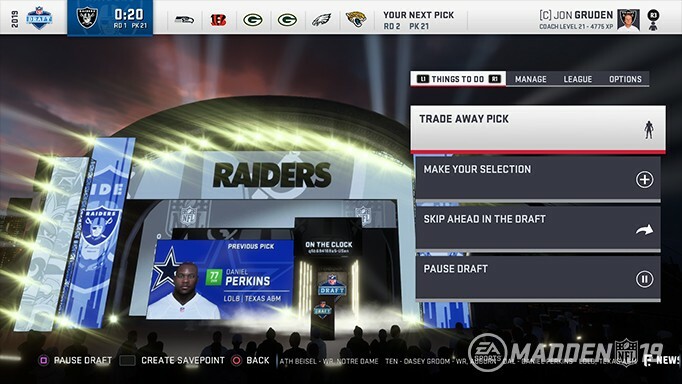 In addition, you’ll experience the NFL draft in Madden in a brand-new way. The draft stage presents which team is on the clock and who the previous pick was on giant video boards in front of a crowd. When it’s time to make your pick, your draftee will be sporting his new uniform while his ratings and development trait are revealed. These amazing environments deliver an immersive experience in Franchise while you build your ultimate dynasty. We want you to live in your Franchise and want to help you tell the stories of each game. We’re doing this by displaying some of the top moments from each game as Snapshots. You can take snapshots from instant replay and in the highlight screen, and then the snapshots will be automatically recorded for you from key moments in the game. These Snapshots are integrated throughout Franchise as part of your immersive environments in the hub and in news stories. View full screen Snapshots from your games or from other users in your league by visiting the Snapshot Gallery. The Snapshot Gallery holds the last 100 snapshots from the league. As you load into game, see your very own snapshots in the background. Your snapshots are everywhere! 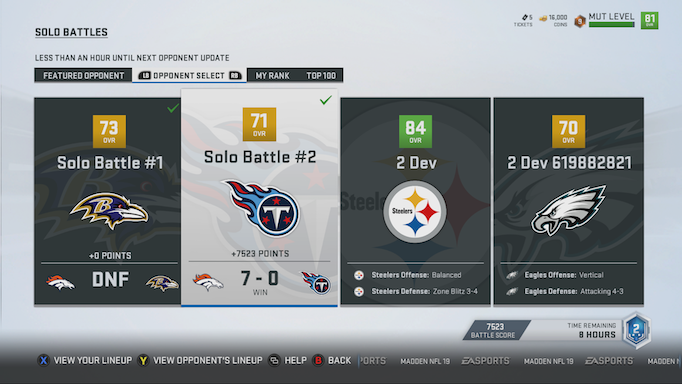 Even the main menu of Madden shows your most recent snapshots. To address another top community request, team captains can now be added and removed from the roster. You can add up to six captains per team. The captains patch will appear in game on the players uniform. Each star denotes how long they’ve been a captain. Not all teams allow for the stars to be shown on the uniform, but all captains will have a star icon visible on the field. This feature will let you quickly identify the top players on the opposing team. At the end of each season, players regress based on their age and development trait. This year the regression is much more dynamic, meaning that each rating will have a unique chance of going down. High Development Trait players regress slower than other players, and the age at which players at different positions start regression has been adjusted as well. This means that high-caliber players have a better chance of extending their careers and climbing their way up the legacy leaderboard. A player’s development trait determines how much XP they earn from training and games. We’ve updated them this year to be Normal, Quick, Star, and Superstar. It’s now much harder to be a Superstar than in years past. There are only a few Superstars per position, which makes them difficult to get, but the traits change more frequently. At the end of the season, each player is evaluated on how well they did compared to the rest of the league. Their performance will result in their development trait going up, down, or staying the same. Superstars need to perform at a consistently high level and be statistical leaders in order to hold on to the precious Superstar trait. Further, we have made rookie superstars extremely rare as part of our generated classes – they’re the ultimate reward of the scouting and draft process. Step further into your Franchise in Madden 19 and build your dynasty. Play this and more in Madden NFL 19, available August 10. 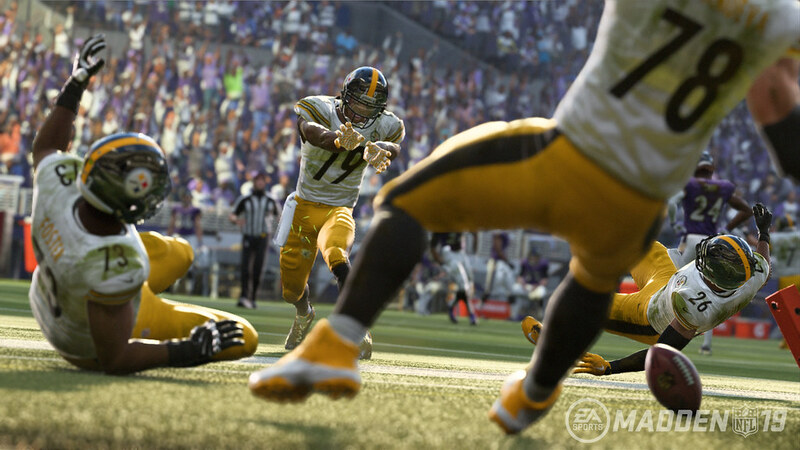 Longshot broke new ground for Madden last season. 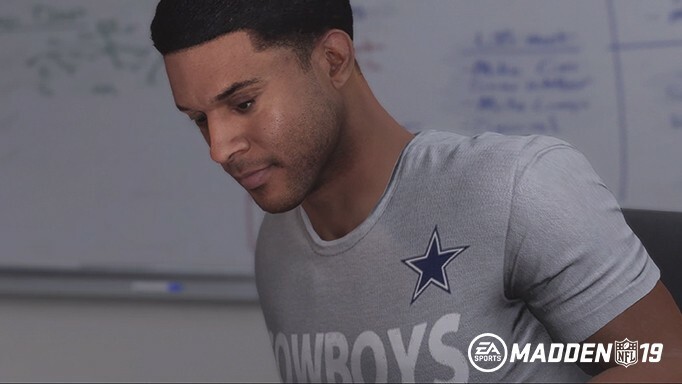 It not only delivered the franchise’s first-ever story mode, but it gave gamers a new way to experience the NFL with an emotional story and engaging characters. Following last year’s critical acclaim, fans can continue the story of Devin Wade and Colt Cruise in Madden NFL 19. Longshot: Homecoming delivers more depth as these beloved characters continue their personal journeys, on and off the football field. Just like other features in Madden, fan and community feedback were the forefront of development. One of the common requests was that gamers wanted to feel more involved with Longshot from a gaming perspective. With that, this season players will be taken through four times the gameplay and be thrown into even more on-field action. Players will continue to track Devin Wade and Colt Cruise on their journey following the results of the reality competition that propelled Wade’s football career into the spotlight. In this season of Longshot, Wade starts training camp with the Dallas Cowboys. Players will control Wade’s story in his quest to prove he belongs in the NFL. Cruise’s story focuses on his attempt to get another chance in the NFL while off the field obligations tear him further away from his dream. 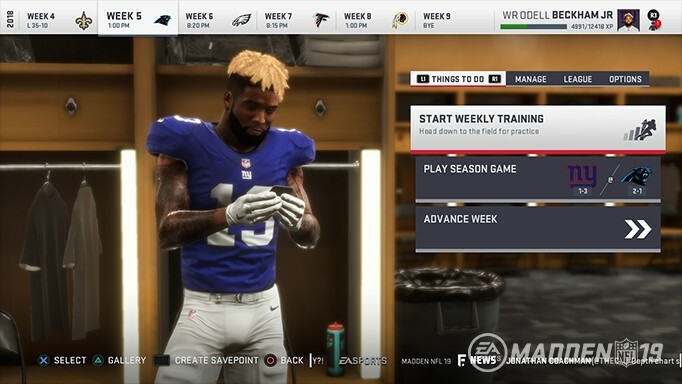 Longshot in Madden 19 also takes its immersive gameplay outside the story mode. 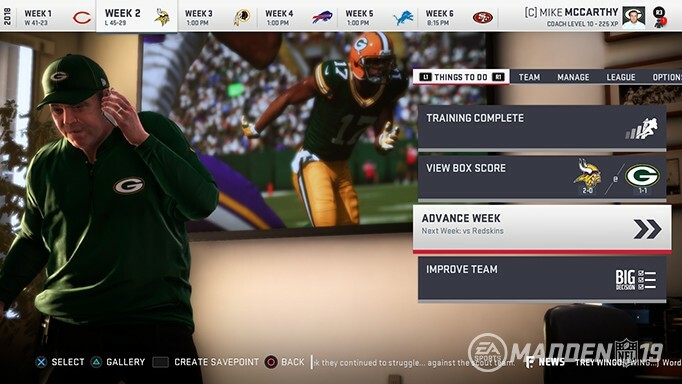 Now, you will be able to continue Devin and Colt’s narrative in Madden’s other popular game modes, Connected Franchise and Madden Ultimate Team. See if you can take Devin to Super Bowl glory in Franchise while building the legend of Mathis football as Colt looks to guide his high school to gridiron success. 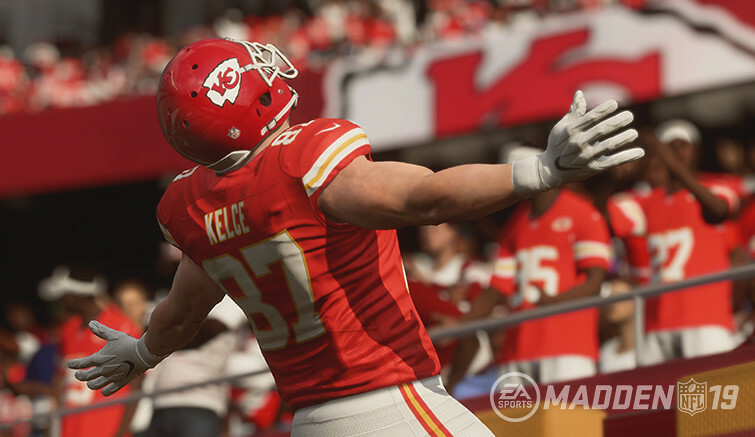 Plunge into a storyline with immersive gameplay and depth surrounding their favorite sport when you take your football prowess into the Homecoming in Madden 19. To achieve these objectives, our goal is to deliver the most significant animation upgrade in Madden history. 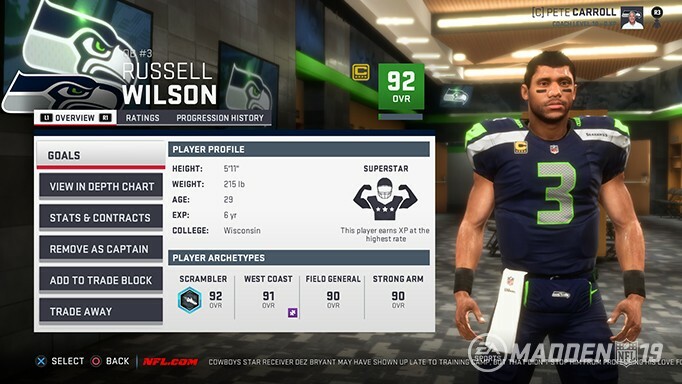 Madden NFL 19 introduces a package of features known as Real Player Motion – featuring authentic player movement, more player control and responsiveness, and player signature behaviors that will immerse players into the NFL each and every game. Speaking of putting your foot in the ground and going, One-Cut is a new ball carrier move that does just that by leveraging the skill of the Acceleration Burst with the precision of the new Player Locomotion. Inspired by ”one-cut” backs in zone schemes, and further supported by Minnesota Vikings’ WR Stefon Diggs’ miracle play in playoffs, this mechanic unlocks the ability to burst out of a controlled cut on a drastic direction change up the field. When making these cuts, there will be a small timing window open to activate a faster version of the Acceleration Burst as the outside plant foot hits the turf, simulating the burst ball carriers get when sticking their foot in the ground and hitting the hole. But be aware, this mechanic is so powerful, it comes with a heavy stamina hit, so you’ll have to be smart about when to deploy the move, as you’ll most likely only have the energy to pull off only one in a single play. The speed and effectiveness of One-Cut is of course tailored to fit each player’s individual ratings and scales per your difficulty level. The defensive counter to One-Cut, Strafe Burst is very similar in its look and feel, as it will allow your defender to have a similar ability to quickly accelerate out of a foot-plant to go make a play. When holding LT/L2 to strafe on defense, you can accelerate out of the strafe and into a sprint by releasing the strafe button and quickly activating the Acceleration Burst on RT/R2. It uses the same timing window system as One-Cut and mastering this mechanic will give your defender the ability to make a play on the One-Cut in the open field, while carrying a similar stamina hit. 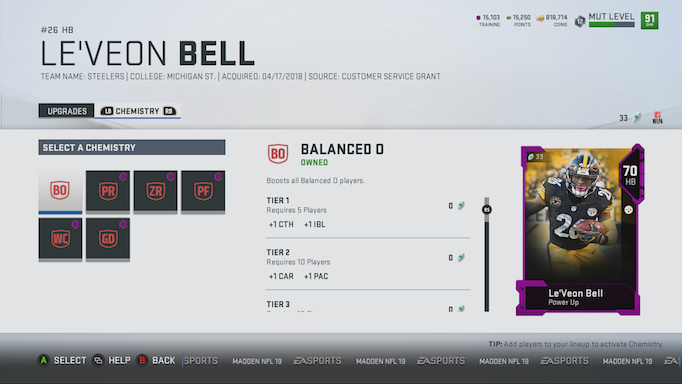 In Madden 19, you can chain together ball carrier special moves and make a smooth transition from one to another before each is completed. You want to quickly transition from a Juke to a Spin and back to a Juke? Real Player Motion allows the freedom and creativity for our players to take their best shot at putting out some of the best highlight videos ever seen. Traditionally, one of the areas of the game where our players felt like they commonly lost control is when navigating through tight gaps in the trenches on running plays. Real Player Motion allowed us to make a new Ball Carrier mechanic to ensure more player control at this critical point in the run game. Known as Hit the Hole, this is a Right Stick mechanic that is a contextual extension to the existing Juke system. When running through the line, if you want to make a quick direction change to get through a gap in the line, flick the RS towards that gap and you’ll see your ball carrier make a contextually appropriate direction change into the gap that will get him through quickly and efficiently, without tripping over his linemen or getting stuck behind them. The player skill here lies with recognizing when an open gap exists or not. If you flick the stick towards a gap that has closed, your ball carrier will still make the direction change, but instead of squeezing through the line, he’ll be tackled instead. Building on the same area as Hit the Hole, Push the Pile is a new ball carrier mechanic that fits the same objective around player control. Sometimes, on inside run plays, there are no open gaps to run through and you need your player to intentionally make contact with his blockers. Built specifically for these cases, Push the Pile is an extension of the Truck Stick mechanic. If you want to engage your running back into the back of a blocker to just push forward or guide the blocking engagement out of your way to gain space, simply hold the Right Stick up as you make contact with the blocker to get into a Push the Pile interaction. Based on the player ratings of all three players involved (the ball carrier, blocker, and defender), there are a variety of results for these interactions. These include versions that fit a big, bruising RB who might truck right into the defender as he’s engaged and knock him down; versions for smaller, shifty backs who can just place their hand on the back of the blocker and guide him out of the way; and of course, situations for the defender to tackle the ball carrier as he’s trying to push through the line. For catching in Madden 19, we really wanted to address some of our players’ feedback from the standpoint of delivering more freedom for the user. Common player feedback around getting pulled into catch interactions you didn’t ask for or watching a receiver jump high in the air and not being able to defend him when you’re trying to knock the ball out. To address those, we’ve introduced a new Mid-Air Collision system for receivers who like to high-point the ball and new additions to the Catching system to give more player agency when user-ing your receiver. Defenders will have more control to decide between interacting with the receiver during the catch or afterwards. ”Play Receiver” is now all about hitting the receiver hard to make sure he doesn’t come down with the ball. On offense, you will have more time to make your decision about the catch you want and react later in the play to make your final choice. The catch mechanics remain the same, but no longer will you jump up in air while holding either Possession or RAC catch mechanics, as we’ve invested in staying closer to the true intent of those mechanics. But be aware that if you attempt to RAC catch a ball that is throw too high, you will most likely not be able to catch it. Choose wisely. In addition to making the game feel authentic, we also have done a lot of work on making the game look authentic. Real Player Motion is more than just stick mechanics and player control – this new technology also has allowed us to build features that keep you in the moment all game long. Check out a few of the highlights below. When looking at all the core fundamentals in Madden, tackling has far and away gotten the biggest visual upgrade. Our players will see tackles influenced by momentum, speed, and weight with our new Momentum Tackle system that ensures tackles play out as expected based on how the players started the tackle. When a defensive back is standing still or strafing to make a conservative tackle on a big, bowling-ball type of back running at him with a full head of steam, you’ll see the defensive back get taken for a ride while getting that back on the ground. Conversely, if the running back is trying to change directions and gets popped by a big linebacker running downhill, the running back will take the force of that hit and fall down in the appropriate manner. We also invested heavily on improving our Tackling Physics system so that players who add-on into a gang tackle or get involved in the play late can find the correct animations to use in these interactions. They will no longer go into a “rag-doll” state or fall down while looking unaware of the game situation. These players will remain active in the play and their bodies will act according to the laws of physics and momentum. We did not overlook the end of the play either. Anytime a tackle happens in Madden, players need to get up off the ground. To ensure that players getting up looked just as authentic as the players during the tackle, we built a new Get-Up system that allows players to smoothly transition from hitting the ground to getting up off the ground, to keep you immersed the experience. You’ll see players athletically roll with momentum to get up quickly, or see players intelligently delay getting up while other players on top of them get up first. Lastly, we did a complete refresh of all of the Hit Stick animations. Every Hit Stick in the game will be new and use the Momentum Tackle system to ensure the same visual quality we expect with all of our tackles. Some new features also come in with the Hit Stick improvements. You can now attempt to Hit Stick a receiver during a catch but be careful not to be early or you will be flagged for Pass Interference. And the timing window has been decreased so that the Hit Stick is a true skill mechanic that will come with a heavier risk of broken tackles than we’ve had before. Beyond the features we’ve built for in-game physical immersion, we also wanted to deliver some personality to go with it. There’s two features we’re introducing in Madden 19 that deliver on Player Signature; QB Pre-Play Signatures and User-Controlled Celebrations. We studied hours of film and watched QBs across the league to identify what makes each QB unique in his behaviors and mannerisms before the snap and have begun to reflect that in Madden. Green Bay Packers’ QB Aaron Rodgers adjusts his thigh pad all the time. Kansas City Chiefs’ QB Patrick Mahomes is very deliberate when making pre-snap adjustments. All of these behaviors will be reflected in Madden 19 on multiple levels, including Contextual (fidgets), Functional (pre-snap adjustments), and Audio (all supported QB’s will have contextually correct on-field wires associated with each signature animation). We are launching with a handful of NFL QBs fully supported and will continue to update more via post-launch updates. Just like with the QBs, we spent dozens of hours watching film to see what celebrations NFL players are doing and which are the most popular, such as “Duck-Duck-Goose,” “The Bobsled,” “The Safe-Breaker,” and of course the many versions of “The Gronk Spike.” You will see a wide variety of celebrations that you see on Sundays, and we will continue to update this content all year long via post-launch updates. We’ve made several additions and improvements to our Coverage AI logic. For starters we’ve added new rule sets for Cover 4, Cover 3, Cover 2, as well as other improvements. Here are some of the changes we’ve made. Cover 4 – We have two new versions of Cover 4 (Quarters and Palms). Quarters and Palms are commonly referred to as “Man Match” defenses, which simply means the defenders in coverage can match up and play man-to-man. Both coverage concepts are similar but with two key differences. Against a formation where a slot receiver is present, and if the slot receiver runs a quick out, the defense in Cover 4 Quarters will handle this route with the “Quarter Flat” player. In the same scenario with Cover 4 Palms, the defense will handle this route with the cornerback who’s playing “Outside Quarter.” In a sense, the coverage plays like a Cover 2. Cover 3 – For Cover 3, an emphasis was placed on improving the logic for Curl Flat defenders and adding rule sets for standard Cover 3 so it’s better equipped to handle route concepts from Trips and Bunch formations that traditionally give it trouble. When the offense aligns in a Trips or Bunch formation, Cover 3 Match, Cover 3 Sky, and Cover 3 Buzz plays will function more like the Cover 3 Mable play from Madden 18. Tampa 2 – The primary of focus with Cover 2 was adding new rules and logic for the Middle Read and Vertical Hook defenders. The Middle Read player will now do a much better job of getting to the deep middle of the field to defend against pass routes that cross that area. We also continued the work with our Cloud Flat players in regard to defending hi-lo route concepts and with new press animations. New Plays – The defensive theme continues as we’ve added a new defensive formation called “Big Nickel Over G.” This formation uses 4-2-5 personnel which is (four down linemen, two linebackers, and five defensive backs). Three of the defensive backs are safeties, thus the name Big Nickel. The formation contains new plays and coverage concepts. Madden season is nearly here. You can almost hear the pending flood of nonsensical trash talk and see the rage quits on the horizon. With new features and updates for fan-favourite modes, Madden NFL 19 will push the franchise higher than ever before. Before diving into the digital gridiron, it’s important to know what Madden 19 has to offer. Here’s a quick breakdown on some of the biggest features this season. Likely the most significant change existing Madden fans will notice is Real Player Motion (RPM). RPM not only delivers a boost to player motion authenticity, it brings a higher level of control to Madden. Through new animations, players will get a more realistic football experience, being able to make the same insanely quick cuts their favourite NFLers do on Sunday. Push the Pile is the perfect example of what RPM produces. 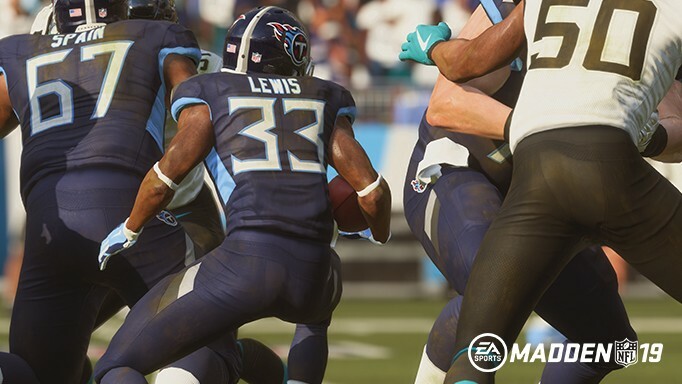 Just like in the NFL, players can now use their blockers to edge out some tough ground yards by holding the right stick as they make contact to trigger different animations based on player ratings and the type of running back being used. A big RB might truck through an engaged defender, while a smaller RB might put his hand on the back of his blocker to plow through traffic. Gamers will have to respect the Acceleration mechanic even more, too. The quick cuts introduced by RPM are a part of your arsenal as long as you’re not spamming the sprint button. Speed is no longer the ‘I-Win’ button it used to be in Madden; it’s all about stick skills and player control. Another feature RPM brings to the table that I have to highlight, though, is an entire arsenal of celebrations, ideal for pouring salt in the wound of victory after a game-winning score. You’ll see tons of team celebrations as well. Keep an eye open for new ones too, as we’ll be adding them throughout the NFL season via updates post-launch. Last season, Madden broke ground, introducing the franchise’s first-ever story mode, Longshot. In Madden 19, you’ll continue the story of Devin Wade and Colt Cruise following the results of the TV competition that propelled them into the spotlight. But this time around, you’ll control both Wade and Cruise as they resume their journey of personal growth and NFL stardom. Part of the community feedback around Longshot was that they wanted more action. You ask, we delivered! This season, Longshot: Homecoming features four times the amount of gameplay and on-field action, offering even more reason to dive into this emotionally-driven story. 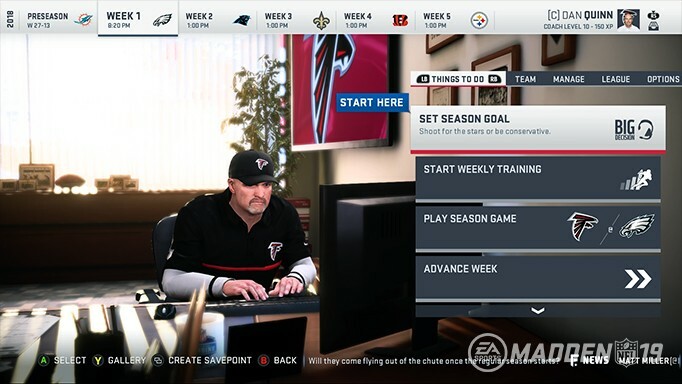 Your favorite manager modes are back and better than ever in Madden 19. Progress any player to become the foundation of your roster by playing games, unlocking training points, and unlocking special abilities throughout the season. MUT Squads was a big hit last season, as the mode allowed gamers to combine efforts to form stacked rosters to take on other players in 3 vs. 3 matchups. 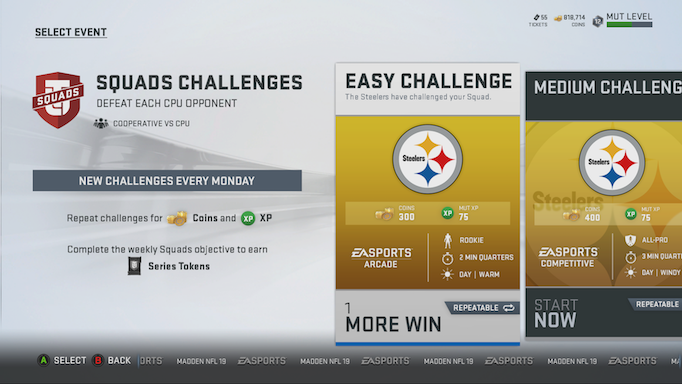 In Madden 19, you can now combine those efforts against the CPU in difficult challenges built by MUT designers. With Franchise, it’s all about building an NFL dynasty the way you want. 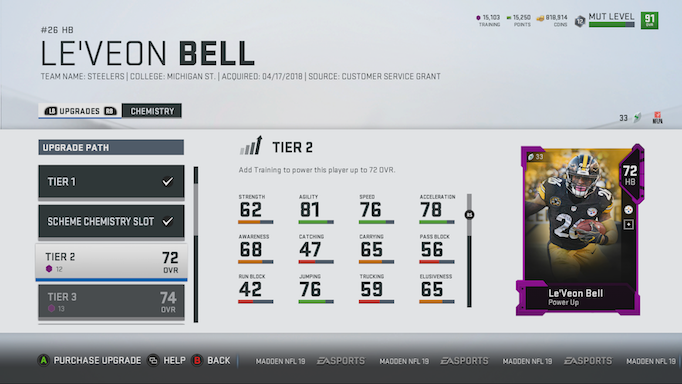 You can achieve individual and team rating boosts by matching Player Archetypes to your scheme. Picking up and starting the players that fit your scheme best leads to on-field benefits. As you earn XP on the field, use skill points to boost a player’s specific skill set. If you’re using a scheme that utilizes a mobile QB, then using a skill point will provide an increase to appropriate stats to make your player more effective on the field. Grab the inside edge on the competition and start playing today with the Hall of Fame Edition. You’ll not only score the full game, but you’ll get tons of content to immediately boost your MUT roster. There’s no better beginning to a dynasty than a dynamic WR, like Hall of Fame Edition cover athlete Terrell Owens. You can choose between Owens or four other NFL legends (Brian Urlacher, Rod Woodson, Dan Marino, and Terrell Davis) to be the cornerstone of your team. If that wasn’t enough, you also get 12 Gold Team Fantasy Packs, one Elite Madden 19 Antonio Brown, and two All-Madden Uniforms. With all this, Madden 19 is the season to not miss!